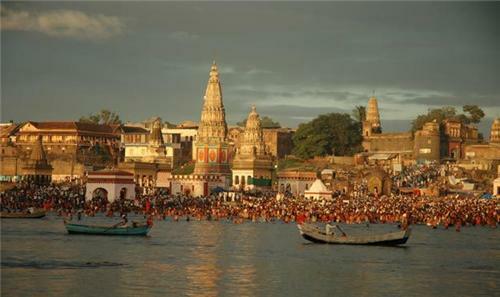 Pandharpur, which is located 65 km west of Solapur district, is one of the most revered pilgrim sites in Maharashtra. The city, which is also known as Chandrabhaga due to its half moon like shape, is situated on the banks of Bhima River. Most of the temples in Pandharpur are dedicated to Lord Krishna and Lord Vishnu. Pandharpur homes a large and old temple on the banks of Chandrabhaga, which is dedicated to Lord Vitthal and Goddess Rukmini. This temple, which is known as Vithoba temple or Shri Vitthal - Rukmini Mandir, was founded in 13th century. The site, where Vithoba temple is located, is known as Kuldaivat of Mahrashtra and the Southern Kashi of India. It is believed that the temple has been renovated in 1195. People from lower castes were not permitted to enter this temple before the year 1947. But, now the temple is open to people of all communities. Pandharpur is famous for saints like Sant Tukaram and Sant Dnyaneshwar, who worshiped Lord Vitthal. Vitthal, who is also known by the names Vithobha, Pandurang, Pandharinath or Pandhari, is considered as the Supreme God of the Universe for all the Maharashtrians. Vitthal is the incarnation of Lord Vishnu. The word Vitthala is derived from the word Vishnu in Kannada language and Panduranga is a Sanskritized form of Pandarga, which is the old name of Pandharpur. Vitthal temple, which is the main tourist attraction of Solapur, homes totally nine doors on four sides. Eastern side: The Vitthal temple has four doors for the entrance on the eastern side and they are used by different reasons. The first door or main gate is called Namdev darwaja and the first step of the temple is called Namdeo-Payri. Namdev was a strong devotee and worshipper of Vithoba, who took self-immolation in 1350 AD with his 14 family members. Anniversary day of Namdev is celebrated every year here. The right side of the step, which is ornamented by brass metal, homes the idol of Namdev. The second door leads us to the temple. The third door at eastern side is called Tati door and we can see Kanhopatra Temple, Laxmi Mandir and Venkoba Temple here, if we enter through this door. Southern side: There are two doors on southern side of the temple among which the first door is for ladies and the second door is joined to Bajirao Padsali. Western side: The western side possesses only one big and main door, which is used for exit during celebrations. The vehicles that come from S. T stand and ‘Choufula’ stop here and you can also park your vehicles here. Northern side: There are three main doors on the northern side. The first one is Rukmini door and the second one is Rukmini- Gopur door, which leads you to the red stone Rukmini Sabha Mandap. The third one is the entrance door of Bodhlebuva’s Verandha. After Namdev step, you can see stone mandap at the entrance of the temple. An idol of Shri Sidhivinayak is located on the left side of this mandap. There is ‘Nagarkhana’ above the mandap where people play an auspicious music in early morning and evening. A lofty wooden mandap, which is called Mukhya Mandap (Main mandap), can be found after Shri Sidhivinayak Darshan. This pavilion with 45 feet high has a ceiling made from teak tree. You can see various poems are written on the wall, painted pictures of saints and information boards in the pavilion. If you climb through the main pavilion, you reach to ‘Treasure Pavilion’ where you can see a bell dedicated by Peshwa. The left side occupies an ornamental house. There are three doors to enter to the main temple, out of which the second one is covered with brass sheet. You can see the face of the lord Vitthal through this door and the see the feet through the left side door. You can see ‘Solkhambi Pavilion’, which stands on 16 stone pillars, when you enter the temple. These pillars occupy 64 pictures of Mahabharat and 10 incarnation of Lord Vishnu. There is a painted stone (Rangshila) in the Solkhambi where people leap by holding their ears and bow down to the Lord Vitthal. Then there is the entrance of Choukhambi Pavillion, which stands on four pillars. The right side of the pavilion homes the beautifully arranged bedroom of Lord Vitthal. The temple’s sanctuary has a wooden railing, a door covered by silver sheet and walls made up of marble. The whole appearance can inspire the people who come to meet Lord Vitthal. The dais of Lord Vitthal, which has been based on four pillars, is 3 feet high. There are two caved cows on both sides and a silver plate at the back of the dais. 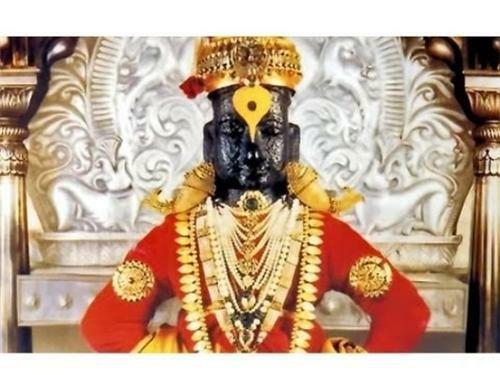 The idol of Shri Lord Vitthal is of three and half feet height and light complexion with the hands rested on waist. The slight smiling face of lord Vitthal can make people forget all their sorrows. A standing image of Vithoba is enshrined in the sanctum where all devotees irrespective of caste can enter and place their head at the feet of Vitthal on rare occasions. This special ritual is called ‘Pad-Sparsha-Darshan’. The other daily rituals performed in the temple are Kakad Arti, Mahapuja Mahanaivedya, Poshkh Dhoop Arti, Padya Pooja etc and all these are performed in main Vitthal temple. If you enter from Namdeo-Payri and come out of the westward Exit, you can see various other temples as many as 25, in the same premises like Garud Mandir, Ganesh Mandir, Ekmukh Dattatraya Mandir, Kanhopatra Mandir, Satyabhama Mandir to name a few. The worship of Vitthal in the Pandharpur temple is mainly based on the contents of Puranas. The contents of Vaishnav saints of Maharashtra and Karnataka during the 13th century through 17th centuries namely Namdev, Gora Kumbhar, Dnyaneshwar, Chokhamela, Tukaram, Purandara Dasa, Gopala Dasa, Vijaya Dasa, Eknath and Jagannatha Dasa have augmented the worship. Four annual pilgrimages of Hindu devotees are conducted in Pandharpur temple among which the pilgrimage in the month of June and July are famous with the largest number of pilgrims. Around 5 to 7 lakhs people participate in this pilgrimage. They gathered together and started their pilgrimage from neighboring villages like Alandi to Pandharpur carrying the palanquins of the saints. This biggest festival is called Waari. The pilgrimages in the month of October- November, January-February and July-August are the second, third and fourth respectively in terms of number of participants. Then the pilgrims take holy bath in Bhima River. People have to stand in queues 3 km long in order to take Darshana of Lord Vitthala during these days. Nearest airport to Pandharpur is at Pune, which is at a distance of 204 km away. As Pune is a well connected airport to all major cities in India, Pandharpur is easily accessible. You can get taxi from Pune to Pandharpur at a rate of Rs 2500. Kurwadi at distance of 52 km away is the nearest railway station to Pandharpur. Solapur, which is 74 km away from Pandharpur, is the major railhead. Taxi is available from Solapur to Pandharpur at a fare of Rs 1000. State owned transport buses are also running between Pandharpur and nearest cities like Mumbai, Pune and Solapur etc.